SXSW in Austin, TX announces appearance by Todd at the 2018 music festival. Tomorrow (May 12, Mother's Day) is the webcast for Todd's Official STATE Visit live from the Paramount Theater in Huntington, (Long Island,) New York. Even if you can't watch it live, the webcast will be available ON DEMAND until September 15. This is a great deal for only $19.95. Visit http://www.toddwebcast.com to sign up, and check out the new video trailer at http://ksstudio.com/State_trailer.html, to get a taste of the show. Todd Rundgren will release his new studio album "State" on the Esoteric Antenna label via Cherry Red on Monday, April 8, 2013. It's his 24th solo studio album. Toddstock II V6.5 has been announced! The festivities are June 17-22, 2013 at Nottoway Plantation & Resort, near New Orleans, Louisiana. Check http://toddstock2v65.com for details. Todd Rundgren, rock and roll icon, guitarist, interactive progenitor, singer-songwriter and record producer, plays the Manchester HMV Ritz on Saturday October 1st. The Manchester date is the first of several UK concerts billed as "An Evening With Todd Rundgren". the shows are described as "The greatest hits tour Todd fans have been waiting to see for years." Tickets for the Manchester HMV Ritz concert on October 1st are available from the 24 hour ticket hotline: 08700 603 777, www.seetickets.com. Meanwhile, Rundgren's three night residency at the London Jazz Cafe (October 3-5th) is completely sold out. These are Rundgren's first UK dates since 2010's sold-out London Hammersmith Apollo concert where he performed his 1973 album A Wizard, A True Star. Rundgren is widely regarded as the godfather of music and multimedia. Having founded and The Nazz, the quintessential `60's power-pop psychedelic band, in 1969 he left them to pursue a solo career, recording his debut offering, the classic Runt. It was 1972's seminal Something/Anything, on which he played all the instruments, sang all the vocal parts, and acted as his own producer, that catapulted Todd into the superstar limelight. Among Rundgren's impressive 50+ production projects are albums by Patti Smith, Cheap Trick, Psychedelic Furs, XTC, Grand Funk Railroad, New York Dolls, Hall & Oates, and Meat Loaf's multi-platinum debut Bat Out Of Hell. Tour dates announced for Todd Rundgren's Utopia in November 2011 - http://TRConnection.com/tour/t2011. If you are a true Todd Rundgren fan, then you don't want to miss out on this exclusive live broadcast through TodoCast TV of Todd Rundgren Live at the Coach House on July 16! You can enjoy Todd Rundgren from the comfort of your own home. 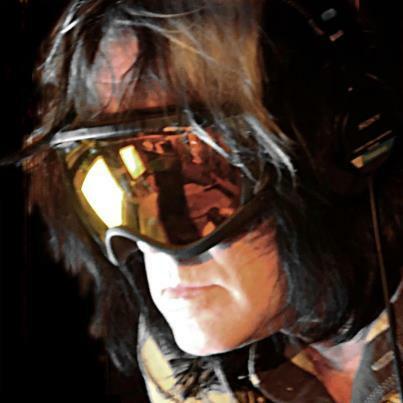 Todd Rundgren, rock and roll icon, guitar genius, interactive progenitor, consummate singer-songwriter and record producer, will get up close and personal with four rare UK concerts in October 2011. Dates include HMV Ritz, Manchester on Saturday October 1st, and the London Jazz Café on Monday October 3rd, Tuesday October 4th and Wednesday October 5th. Tickets go on sale from 10:00 GMT on Tuesday June 28th. Ticket Hotline: 08700 603 777, www.seetickets.com. The October 2011 dates mark Rundgren’s first UK shows since 2010’s sold-out London Hammersmith Apollo concert where he performed the entirety of his 1973 milestone album A Wizard, A True Star. An acclaimed record producer, composer, songwriter and recording artist, Rundgren is widely regarded as the acknowledged godfather of the marriage of music and multimedia. Having founded and fronted The Nazz, the quintessential `60's power-pop psychedelic band, in 1969 he left them to pursue a solo career, recording his debut offering, the classic Runt. It was 1972's seminal Something/Anything?, on which he played all the instruments, sang all the vocal parts, and acted as his own producer, that catapulted Todd into the superstar limelight. Among Rundgren's impressive 50+ production projects are albums by Patti Smith, Cheap Trick, Psychedelic Furs, XTC, Grand Funk Railroad, Hall & Oates, and Meat Loaf’s multi-platinum debut Bat Out Of Hell. Todd reportedly among the "many more" to appear at the Propect Park Bandshell. THURSDAY, JUNE 16, 7:00 P.M. The maverick music producer Hal Willner brings his singular network of artists and his genius for curating multi-artist concept shows to the music of the Civil Rights Movement. This concert celebrates the 50th anniversary of the Freedom Rides. The evening begins with a pre-performance artists’ discussion. Nevessa is proud to announce a webcast concert by Utopia in a special Reunion performance on February 2, 2011 at 8PM EST. Recorded at the Highline Ballroom in New York City on January 30th it will include musicians Kevin Ellman, Jesse Gress, Moogy Klingman, Todd Rundgren, Ralph Schuckett, John Siegler and Kasim Sulton. This is a not to be missed event for every Utopia fan. Each $19.95 webcast ticket includes access to the webcast and video on demand for 30 DAYS. The webcast will be available in three stream rates. You can switch easily between them to see which works best for you. A 400k stream for those with slower machines or connections, an 800k stream and a new pristine 1200k stream for near HD quality. Our 24/7 customer support can assist you with any connection issues. If you live in a timezone for which the live event is inconvenient or wish to view it again and again the video on demand is perfect for you and will be available a few hours after the live performance finishes. More details regarding Todd Fantasy Camp public concerts. Please note clarification on cover charges per evening event. All of these are in the Sacramento metropolitan area. Driving time estimates are shown for each location, based on my own personal experience. Public Transit is not likely to be a viable option. For maps, see Todd Rundgren 2011 Tour. Also, all evening events will be broadcast live over the internet. Todd makes a rare concert appearance in Sacramento, CA (you know I'll be there) when he plays "Pearl on the River Patio Jam" on Monday, January 17, 2011. Details at their site. Tickets will go on sale after January 3, 2011. It's in conjunction with the MyRecordFantasy Camp and a portion of the proceeds will benefit the Make-A-Wish Foundation. Todd Rundgren's Utopia. Yes, you read that right. Todd Rundgren's Utopia featuring the original 1974 lineup for Rundgren, Klingman, Siegler, Schuckett and Ellman (sorry, no Frog). Plus a special appearance by Kasim Sulton. All at the Highline Ballroom in New York City on January 29, 2011. The show is already sold out, but a second show is scheduled (tickets not yet on sale) for Sunday, January 30, 2011. Just so we are all clear and there are no misconceptions..... This is what the Exhibit will look like for Todd at the Rock & Roll Hall of Fame. It's not a retrospective but a display. In fact, I think we are bumping Eric Clapton out of his glass apartment and taking over the lease! See ya in Akron and then Cleveland! 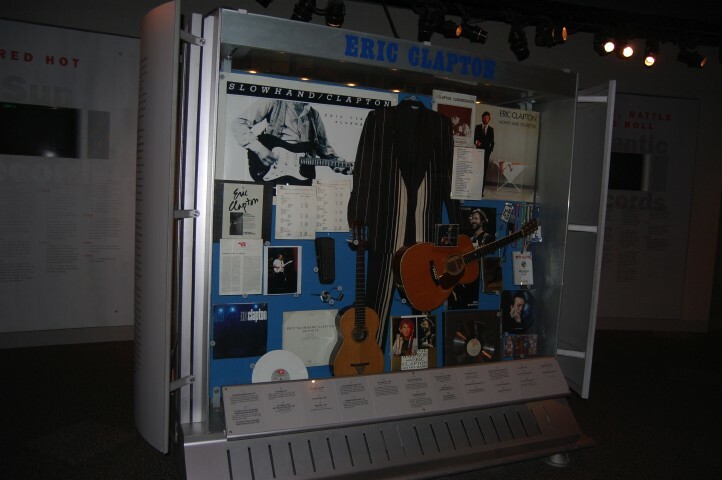 The likely location appears to be the current display case for Eric Clapton memorabilia, displayed here. Todd is expected to make an appearance at the HOF on Monday, September 6, along with Roger Powell and Kasim Sulton for a photo op and autographs. The universe is abuzz with the news that Todd will perform "A Wizard, A True Star" live for Rundgren Radio Birthday Bash II this coming Labor Day Weekend. Tickets will go on sale for this event-not-to-be-missed on Monday, May 4. The show will take place in the Akron Civic Theatre in Akron, OHio on Sunday, September 6, 2009. For the latest information, check out www.awatslive.com and keep an ear to RundgrenRadio.com. Todd is scheduled to be a speaker for the DePauw University (Greencastle, IN) Timothy and Sharon Ubben Lecture Series. He's to speak on April 8, 2009 at 7:30 PM (Note corrected time]. Admission is free. For additional information (and a great overview article on Todd's career) see the announcement and for a follow-up article. As has been highly-reported in the online press, Todd is a participant in the 2009 Rock 'n' Roll Fantasy Camp, held in Hollywood, CA from April 29-May 3. For additional details, see http://www.rockcamp.com/. It's not for the casual fan, as it does cost thousands of dollars to attend. Todd was a featured keynote speaker at the "Billboard 2004 Digital Entertainment Conference & Awards" on November 4, 2004 in Los Angeles. Karen Pals attended and prepared this report on his comments. Utopia Live in Boston 1982 (released in the US July 27, 2004) is reviewed. According to Warner Bros. VP of marketing Eric Fritschi, the label will sweeten the pot for digital retailers by offering "Morph" with a bonus cover of Al Green's "Rhymes," produced by and featuring Todd Rundgren. A 5.1 DVD-Audio mix of "Liars" is out. Todd did the mix in April, 2004. One source is DVD4Music in the UK. Todd is not actively engaged in any productions at this time. I'm producing a documentary about my band The Tubes. I interviewed Todd, Michelle and Kasim Sulton for the film. I have a website, http://thetubesproject.com with a trailer and picture of Todd in the "production photos" section. I thought Todd/Utopia fans might be interested. That was MUCH FUN-I am pleased to be a part of such an elaborately diverse gathering of die-hard musicheads ...and even greater to know I am still "Guilty Pleasure's Todd Rundgren correspondent"
We naturally dove into a current show-5/21/5 Redwood City, CA- for the closer, While My Guitar Gently Weeps from (thanks LISA). Besides being a great example of the shows 'encore set', Casey is a big Beatles fan and had a guest on earlier (Jim Birkenstock) that spoke of the Fab Four. Next we segued into the most recent release's closer, Liar, to show musical diversity and promote the most recent release. Finally we rapped up over most of the rest of Faithful side two by speaking a bit of Liv and her "spiritual father", the origin of the name The Nazz, and Todd's upcoming tour plans with Hall and Oates and Donald Fagen. Overall we filled about 22 minutes of airtime with TR! THANKS CASEY and CONGRATS on 15 YEARS! The Late Show with David Letterman on Wednesday, April 28, had Todd and the band as the musical guest. They performed "Soul Brother." Download or Stream it or View it. The Letterman Show is always aired a day late in Europe on "ITV 2". This week's appearance will be aired on ITV 2 on Thursday night/Friday morning at 1.55am, and then repeated at 5.10am. Stewkey's Live Radio Interview on Saturday, July 26th! For those of you in the New York City area, WFMU-FM DJ Bob Brainen, a long-time friend and fan of The Nazz, will interview Stewkey on his weekly show. Stewkey will talk about his work with Todd Rundgren and Nazz, his current band "Nazz Returns" and their new live show, as well as their "kick-off" concert on August 1, 2003 (at "A's Rock 'N Sports Club", 260 So. Washington Ave., Bergenfield, New Jersey starting at 9:30 PM). Tune in to 91.1 on the dial in the New York tri-state area to hear Stewkey on Saturday, July 26, 2003 between 7:00 and 9:00 PM. Sat. July 26, 2003 7-9 P.M. E.S.T. Special Guest: Stewkey Antoni-lead vocalist and keyboard player of The Nazz. The Nazz were a legendary late 60's Philly quartet who's guitarist and main songwriter was Todd Rundgren. We'll be reminiscing about the old days with Stewkey and also talking about the new days and some upcoming gigs that he has. Broadcasting at 91.1 in the NYC area. Todd is listed as having a "Musical Cameo" in the film (now available on video) Elvira's Haunted Hills. Has anybody seen it? Todd appeared on CNBC's "Power Lunch" on June 21, 2000. In addition to performing "I Hate My Frickin' ISP" with the trio, former Utopia drummer Kevin Ellman (now a CNBC guest financial analyst) joined Todd and Kasim on a rendition of the Ikon (short version). Todd was frequently mentioned throughout the two hour show, and several of the normal commentators were listed as possible former members of Utopia. A Unique Event! Two Todd tunes are prominently featured in the movie "The Virgin Suicides": "A Dream Goes On Forever" and "Hello It's Me." Todd appeared on Craig Kilborn's "Late Late Show" on May 2, 2000 and performed "I Hate My Frickin' ISP." He was also sporting a new guitar. It seems that it was a Yamaha AEX502 since named "Percy." Todd appeared on "Politically Incorrect" on Tuesday, April 25, 2000. A transcript is available. Todd appeared on ABC's "Politically Incorrect" on March 17, 1999. A transcript is available. December 1, 1998 - Todd was on Comedy Central's "The Daily Show". Friday November 20, 1998 - Todd appeared on "The Late Show with David Letterman" as a member of Paul's band. Todd appeared on ABC's "Politically Incorrect" on Friday November 6, 1998. The October 2005 issue had a short interview wth Todd about John Lennon.